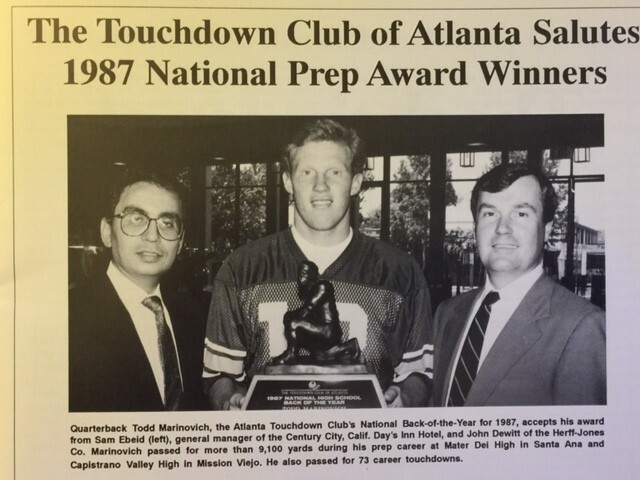 Todd Marinovich, Capistrano Valley High School (Mission Viejo, California). QB 6’4 215 lbs. Marinovich ended his high school career as the nation’s all-time leading passing leader with 9,194 yards good for 73 TDs. Todd transferred to CVHS from Mater Dei High School in Santa Ana as a junior. He was an all-league selection four straight years and was named co-MVP of the South Coast League this year while leading the Cougars to a 9-2 record. In addition to his skills as a quarterback, Todd is a standout on the basketball team and carries a 3.2 grade point average.